This safety vest is available in sizes; S-M, L-XL, 2X-3X and 4X-5X. Click here to view a size chart. 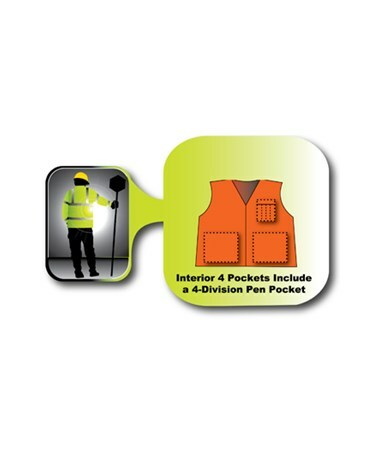 Two tone reflective safety vests, can raise a workers visibility to a whole new level. 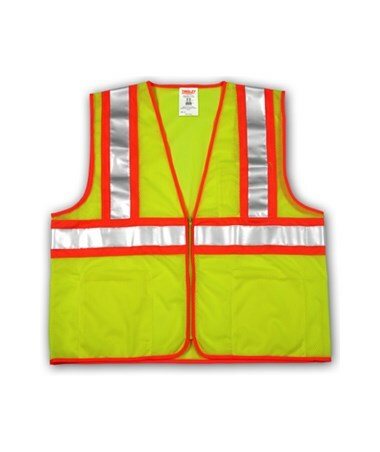 Two tone vests have contrasting fluorescent colors and strips of reflective tape. This bright combination, calls attention and promotes discernibility. Being visible is essential for a safe work environment. 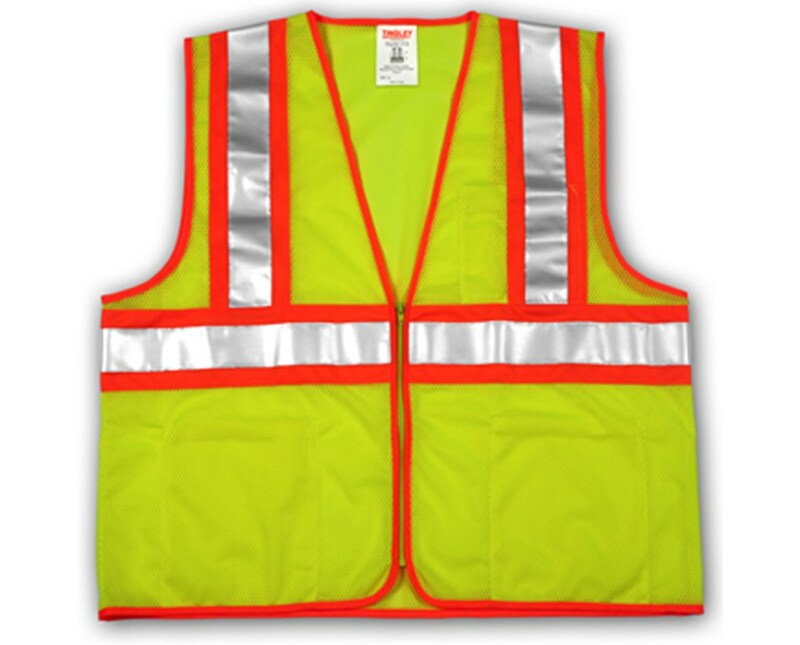 This safety vest, is of fluorescent yellow-green color and is ANSI/ISEA 107 Class 2, Level 2 compliant. Additionally, 2” reflective strips are placed in a harness layout and as a horizontal band. An edge binding and reflective underlay of a contrasting fluorescent orange-red color, provides exceptional visibility levels especially during nighttime and hazardous weather conditions. Together, the background color, contrasting underlay and the reflective strips allow for 360° visibility. Only the best materials were used for this vest. Comfort was of high priority when designing the vest. A lightweight mesh material allows for the body to remain cool even in warm and humid weather conditions. The vest fits well over clothing and zips closed with a zipper closure. The safety vest features four interior pockets. The interior lower right and left side pockets are the same size and measure 7” X 8.5 “. A four sectional pen pocket measures 5.5” x 5” and is located on the upper left of the vest. Underneath the pen pocket is another pocket measuring 5.5” X6”. The vest is available in sizes; S-M, L-XL, 2X-3X and 4X-5X. Click here for a size chart. This zip up safety vest has many great features and was designed to keep a worker visible and safe in a work zone. Order yours today.